As you may recall, in April I told you why you couldn’t miss Exodus, and one great reason was the presence of 10 of the world’s best photographers and videographers. With this premise I couldn’t be more expectant about the weekend of 1, 2 and 3 December … and it didn’t disappoint! During these three days, I was fascinated, moved and learned more about photography, the power of the image, the stories they tell and can tell. All the photographers were excellent! With their interventions distributed through the days of the event, no one left foot and stayed in the audience throughout the whole festival. Always accessible to anyone who wanted to talk to them, ask questions or just meet them. 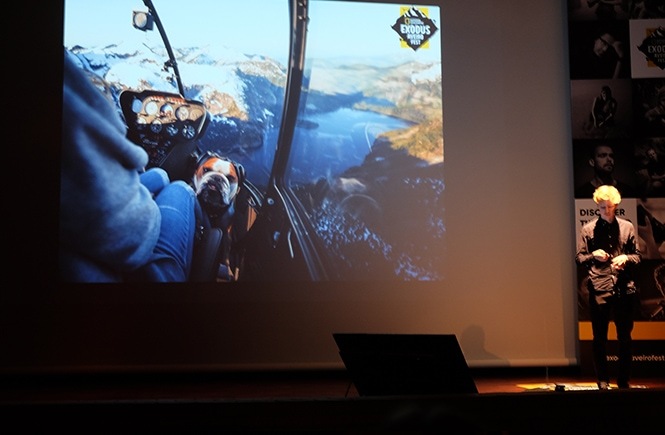 We were with World Press Photo winners, National Geographic photographers, Red Bull premium professionals, sensation-videographers, like someone with a group of friends. 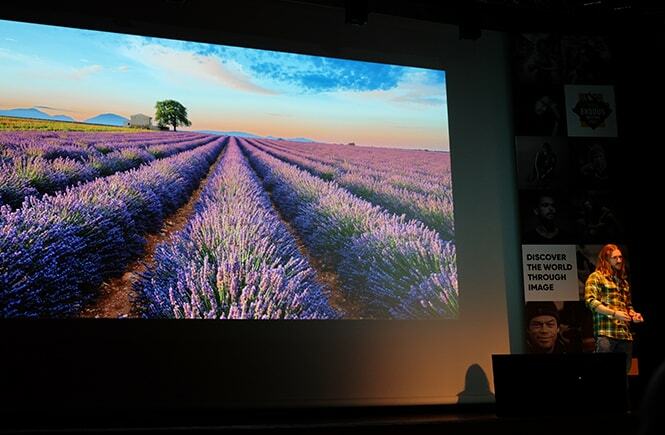 Not to mention the approximately 600 participants (myself included), among professional photographers, amateurs or simply photography lovers, who lived during this weekend in a relaxed and knowledge-sharing environment. 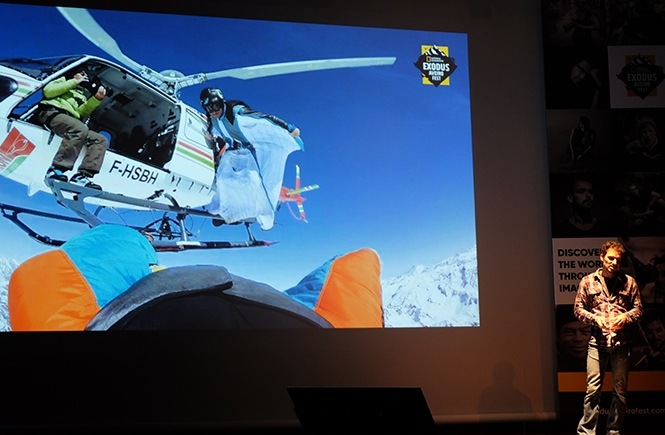 There were nine unforgettable Speaking Sessions (Jody MacDonald had to cancel her presence for having contracted malaria on her last trip) talking about various types of photojournalism, photography and travel and action sports video. I had never heard of Reza Deghati’s work before this event, but I quickly realized why he had been chosen for Personality of the Year. 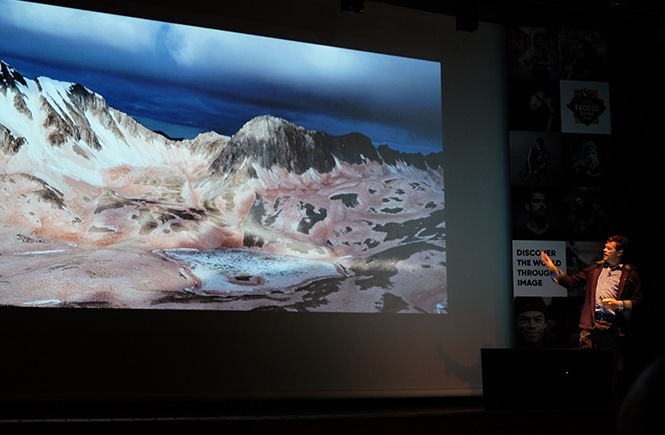 Reza has been a photojournalist for more than 30 years and, in Portugal, he stepped into his 100th country. Exiled in Paris, he has work in several war scenarios and exile camps. He took us on a journey through the countries he passed through: Afghanistan; Beirut in Lebanon; South Africa during Apartheid; to the capital of Bosnia and Herzegovina, Sarajevo; or Rwanda, before, during and after the massacre. With all his professional and personal experience, Reza remains faithful to the essence of his photography: to tell visually and with simplicity the story of who we meet. 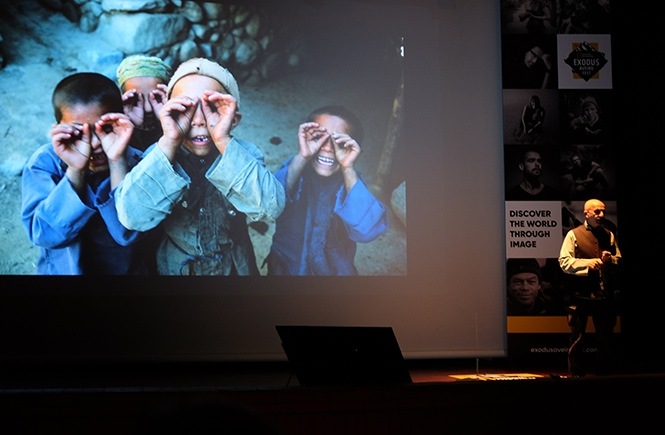 The lady who started the Speaking Sessions is one of my favorite photographers and with whom I had a Masterclass on the 3rd day of the National Geographic Exodus Aveiro Fest. 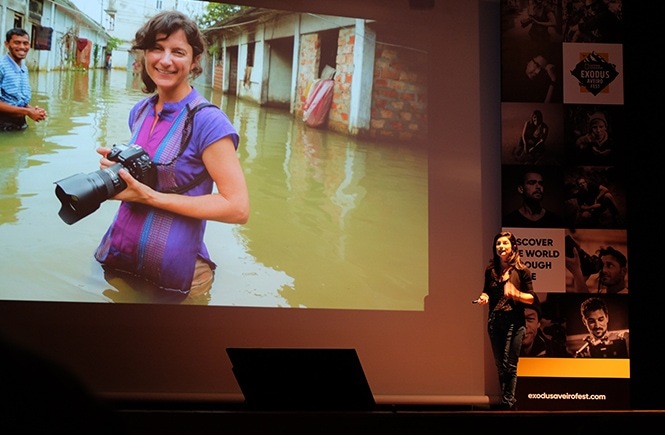 Ami Vitale was an editor when one day decided to change her life and to go to work in the field. She has been in war scenarios, covered natural disasters, but what now opens her heart and smile is the unique opportunity to report the world of pandas in China. Those in charge liked me so much that they gave me the privilege of holding two pandas… President Obama just got to carry one! The Portuguese representative on this festival earned the respect of his peers, who knew him or who heard him for the first time. I had heard of Mário Cruz for the award he won in the World Press Photo, but I had never had the notion of the work behind his Talibes project. A photojournalist from Lusa, Mário asked for unpaid leave for six months to pursue the story about the false Koranic schools in Senegal and the children enslaved there. The crudeness of Mário Cruz’s black and white images, what he passed to obtain them, didn’t leave anyone indifferent and the photojournalist insisted that everyone present had to reveal and denounce the situation so that these establishments may disappear in the future. Konsta Punkka was nervous as he stepped onto the stage. Perhaps because of his young age compared to his peers present, or probably because of his English. But the “squirrel charmer,” as he is also known, let his images speak louder. Konsta shared his passion for nature, his tricks for capturing an image of wildlife, and introduced us to “his animals,” every creature, every hole he stalked for hours to get the picture he wanted. Another name I’d never heard of until this event: Shams! The filmmaker follows a motto of life: Choose a job you love, and you’ll never have to work a single day in your life. It was on this journey of how he found his sense of life that the cinematographer led us. 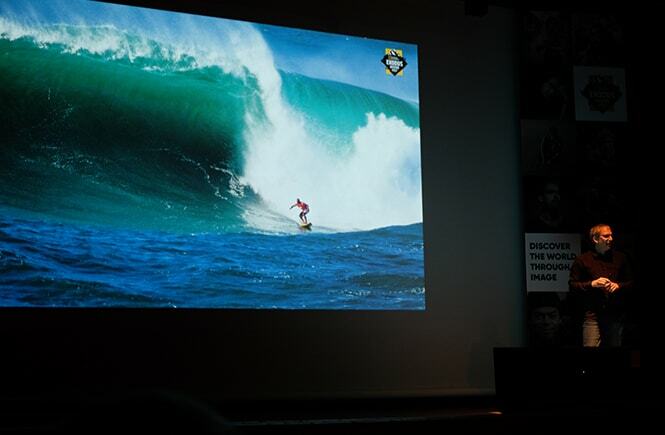 Michael Clark’s lecture kicked off the second day of the National Geographic Exodus Aveiro Fest. Clark is an unavoidable name for adventure and action sports photography, with his phone ringing several times to catch up with Red Bull top athletes. Often overcoming the physical and mental boundaries to achieve a particular image, the photographer believes that we discover ourselves in a whole new and different way when we face our fears. The story of Peter McBride is a tale of love for the land where he was born and for the environment that drives him. One of the Exodus’ most lively photographers, the man who put the Colorado River speaking, told how he used the photograph to show the extreme drought situation that the most significant watercourse in the United States is facing. “The Canyon” was the project that followed for McBride. During a year — and 71 days of hiking in between —, he uncovered a Grand Canyon unknown by many and the risks that the natural park faces due to growing tourism. GMB Akash was the man who in addition to Reza Deghati put the audience standing to applaud his work. Aksh is from Bangladesh, and it’s from there that many of his images emerge about some of the inflictions of the society that saw him born. Photographs that are a real punch in the stomach, about refugees, sexual slaves, mental illness and child slavery. But beyond merely photographing, Akash uses the means at his disposal — notably the result of the sale of his book “Survivors” — to encourage work for many families and end some of the situations he witnesses. You probably crossed on the internet with one of the videos of this videographer. No wonder, as he is one of the most significant contributors to Vimeo and a man highly coveted by tourism boards in several countries. Oliver’s videos show locations and dimensions of a destination that people rarely know. No one is indifferent to them, drawn even more by extraordinary filming and editing techniques. Elia Locardi is the true nomad. In the company of his wife, he sold most of his assets, put the rest in storage, and took what he could carry in a few suitcases. Since then the world is their home, and there’s not lacking spectacular “backyards” to photograph. Locardi doesn’t fool anyone. The photography technique is there, taking advantage of the right light, the weather conditions. But the real magic of his images lies in post-production techniques that he doesn’t hesitate to reveal. 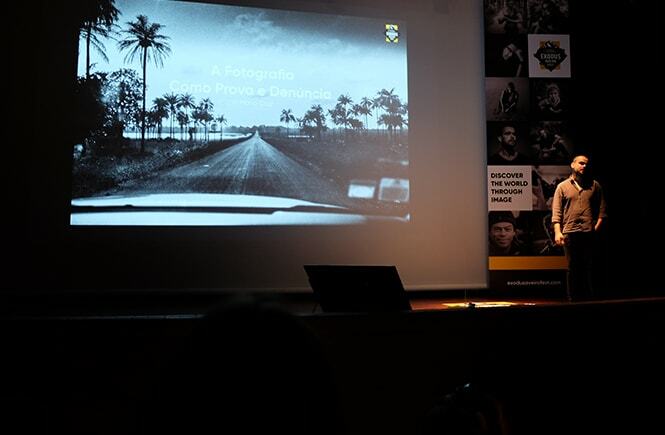 And that’s how the first edition of the National Geographic Exodus Aveiro Fest ended. Theirs’s so much more to say since the two-day event was filled with activities and lots of learning. But if you’re curious, take a look at the work of these photographers and tell me which ones you like best. I can then maybe share with you other ideas that I have heard or learned at the festival. I haven’t heard of this before, what an amazing experience! I can only imagine how much inspiration you were able to soak in, a little bit jealous! This must have been a spectacular event. I sure would have loved to attend them. So much to learn from these photographers. The photos of the elephants and the fox are my favorite. I have never heard of this, but it sounds great. Glad it is now on my radar. I love all the different styles of photography showcased here. But they’re all technically stunning and emotionally moving – no wonder they’re considered the world’s best. Loved reading the stories about each photog – I think Ami’s was my favorite. The idea of changing up your entire life and getting to do something you love every day completely appeals to me. Lovely write up! Thanks, Meagan. I was able to do a masterclass with Ami (you can read all about it in another post I’ve written) and let me tell you she’s such an amazing person! 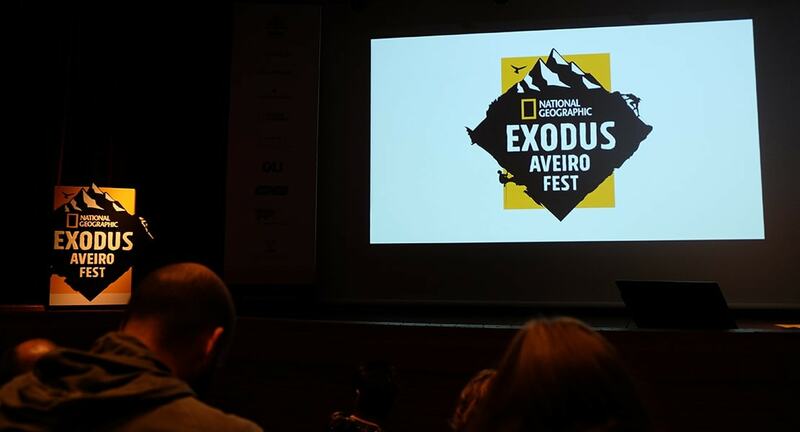 The National Geographic Exodus Aveiro Fest sounds interesting – I’ve never actually come across it before, but I would love to get there and mingle with different photographers, view their exhibitions, and learn about the craft. 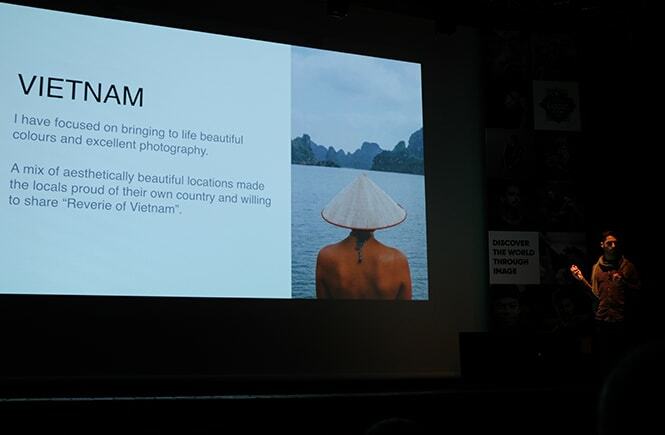 Really unique opportunity too to hear from the photojournalists personally and hear their story behind the photographs which captivate us so much. Thanks for telling me about this festival! 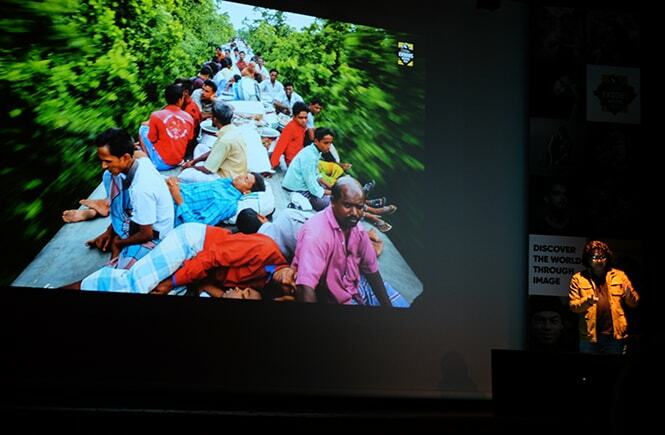 The National Geographic Exodus Averio fest would have been a great learning experience. Each photographer and videographer you mentioned in the post, seems to be the masters in their domain. I loved what Shams said. – Do what you love and you will not work a single day. Edited picture of Oliver is just fab. Loved your post and would love to attend this event someday for sure. Happy continued travels & photographing!